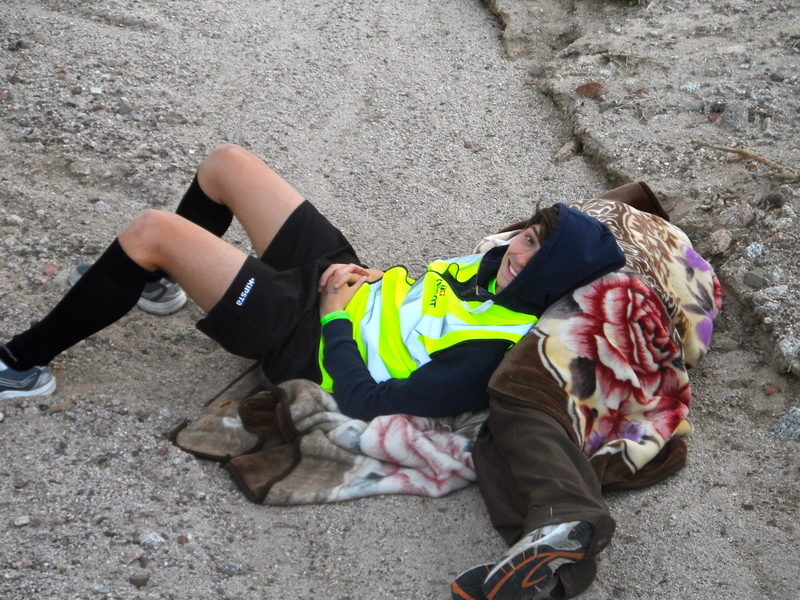 Dead2Red: the night we ran 243km across the desert… by choice. Last weekend we did something a little crazy, even by our standards. On Thursday morning we drove down to the Dead Sea ready to run hundreds of kilometres through the desert to Aqaba, by the Red Sea. Having only found out about it a couple of weeks beforehand, there wasn’t much time for training. And I hadn’t been well so wasn’t going to run at all, but was roped in the day before as one of the other runners was injured. So points for preparation- zero. 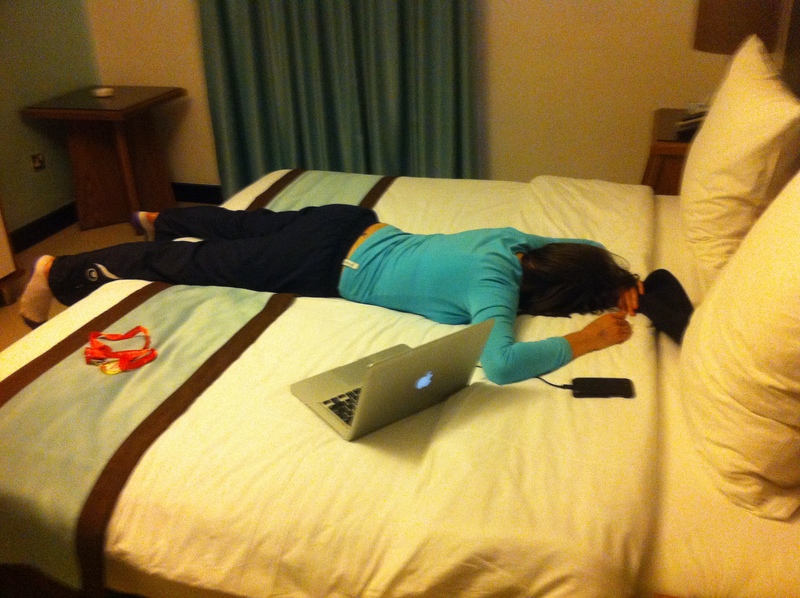 In fact, preparation that morning was absolute chaos. Before that however, here is a quick run-down of how this relay race worked. We ran in teams of ten, and our team was split into two cars. CarA would run the first 15km while CarB would drive ahead. 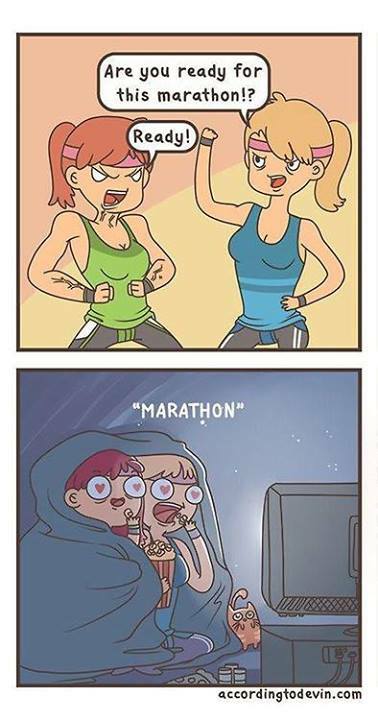 When CarA got to CarB they would swap, CarB would run the next 15km while CarA runners would get a rest. We ran relay-style in lengths of about 250m, meaning Kara would run 250m, then Sam, then the next person and around and around we went for 243km. Sometimes it was more than 15km, as the odometers of the two cars weren’t matched, so we just had to keep running till we found the other car, sometimes up to 17km. 1. Sam thought it would be a good idea to make sure that the thermos for hot coffee didn’t leak. Keeping his hands well away from the lid, he tipped it upside down, only to have the boiling water burst out the thermos’ tap in a fountain of scalding hell. Sam’s reaction was to throw the thermos across the kitchen, shattering the inside of it. He burnt his wrist so badly that it started to blister almost immediately 😦 Sam was more concerned that he no longer had coffee for the trip. 2. 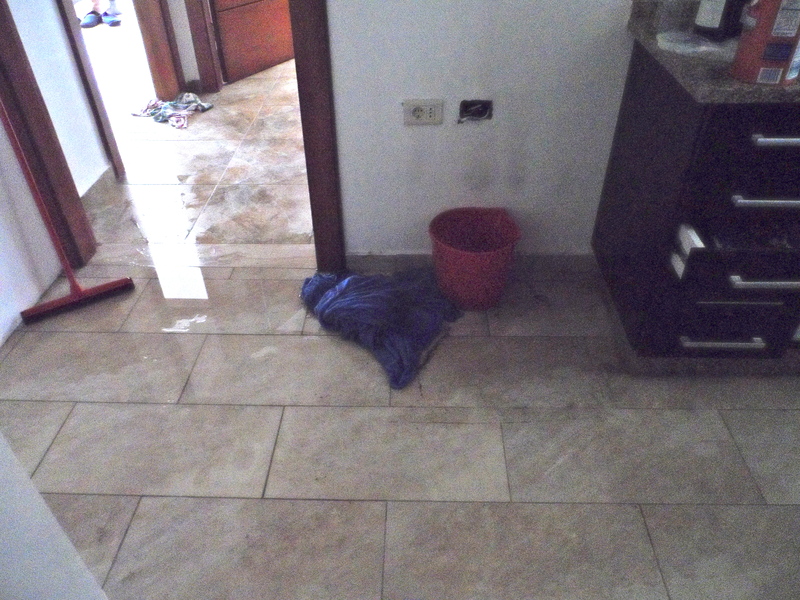 Our apartment had flooded. Water was coming out of a hole in the wall behind the fridge where all the pipes were. This was caused by construction on the roof that had allowed water to gather and leak between the walls, out through a hole and across our kitchen floor. In order to fix this, our landlord had to go up onto the roof in the pouring rain to knock down a wall. Yes, he knocked down a wall down to fix the flood. 3. And in order to knock the wall down, we had to switch the power out because our electricity cables were near the wall he was knocking down. Just picture the pandemonium: Sam with his wrist under cold water packing food with his other hand and Kara skating across the wet floor hurling gym clothes into bags, all in the dark, with loud thumping from above thanks to our landlord’s sledgehammer. But you know what? We still got to the team meeting place on time! We met at the university and drove the 45 minutes down to the Dead Sea, while the other car picked some other team members up on their way. We arrived in plenty of time, but the second car, with our team leader, was held up and only arrived 35 mins before the start – which was also an hour after registration was meant to close! They let us register, thankfully. We were the last team to enter – we hoped we wouldn’t also be the last team to finish! Somehow, after all that, the race started well. The first runner for every team in the race had to run 1km to spread the teams out a bit before the team vehicles started to do their thing. Alexis did a great job, coming in around 15th, and passed the baton on to Simon, who was going to run another 1 km. Poor Simon. We had parked our car at the 1km mark, and the other was back at the start. We found out, AFTER Simon had set off on a super fast pace, that we couldn’t move either car for 15 minutes. So Simon was left to run as far as he could in 15 minutes, not knowing where the hell we were. A lot of other teams had the same problem, but man.. Thankfully Simon was too tired when we picked him up to yell at us much. Followed by half the team yanking at/ramming themselves against the door so that we could swap runners in time. It was great fun though. We had the most awesome team, and conversation in cars switched from English to Arabic, to French to German, to Spanish and even bogan Aussie slang. There was also a lot of yelling, although none of it was in anger. This is despite being physically exhausted and staying up all night! Our poor drivers copped quite a bit of flak however. The other car in our team went so far as forcing the driver to run along next to the runner for a leg to show them how hard it was. Apparently, after that, the other driver was much more willing to stop quickly! And we ran hard. Motivational music blasted from the van to get those about to run pumped up. And we ran even harder when we came up against another team, leading to exhausting rounds of 200m sprints (for about 5km or so) as both teams raged on. We would overtake them, then them us, then us them… It was awesome. And they were about 100m behind us when we finished out 15km leg – we were elated! Then in the hour or so we had to rest while the other car was running, we refuelled ourselves (oh yeah, we almost ran out of petrol too), and sometimes dozed. In retrospect, that wasn’t a good idea as warming back up again got increasingly painful. 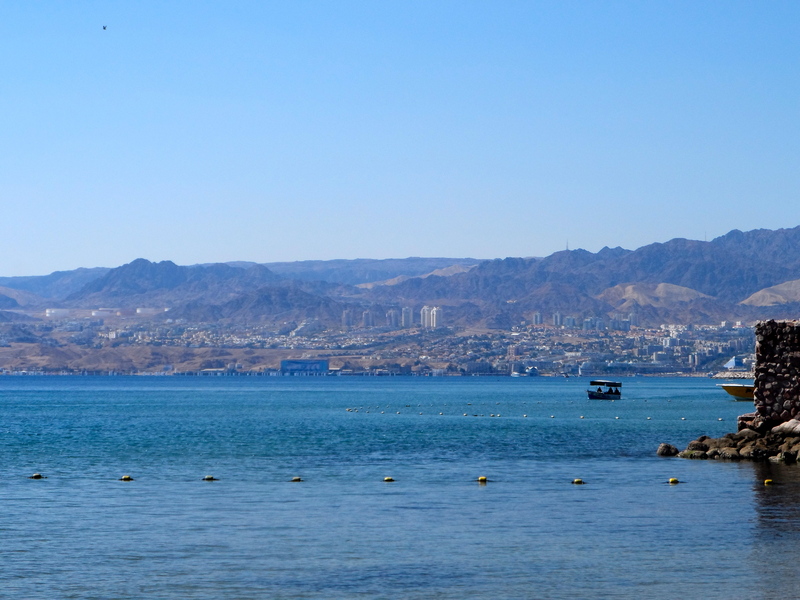 Speaking of painful – about 50km from Aqaba, Sam sprained his ankle. He was 15m from the car and stepped in a pot hole. Not a lucky day for Sam and injuries! He managed to finished that 15km cycle but couldn’t run, or walk, after that. So our car did the last 15km leg with four runners. By this point everything hurt, but the sunrise helped our mood. The two cars did the last part together, rotating between nine people. We crossed the finish line together, with the guys carrying Sam across in what was a pretty great finish. We hobbled to the drinks tents then collapsed in our hotels unable to move. I tried to take a bath, but got stuck as I couldn’t stand up again. After our respective naps, we headed to the main hotel for the finishing dinner party and the most enormous buffet I’ve ever seen. We actually did much better than we’d hoped. All teams have to finish within 24hrs to be counted, so we thought that 20hrs, or 12 noon the following day, would be a reasonable goal. We made it in 18hrs 41mins, including injuries and screw-ups at the beginning! Each car ran their first 10km in 42mins, and both cars had a ‘car best’ of 15km an hour! So, overall, we managed to place in 16th. Unbelievable! This led to some well-deserved recovery the next day, chilling on the hotel Movenpick’s private beach with some spectacular views. ← Why kissing is wrong.